So you’re one of those people who saw the new 1TB COD BLOPS3 (yup, I used that acronym) PS4 and threw up in your mouth a little bit. I understand. That’s a completely reasonable response to what appears to be a bad joke. But let’s get something straight: orange and gray, as a color combination, is actually a good mix. The orange pops dramatically against the dark gray. It makes for a highly interesting visual, and it stands out while not looking unappealing. The problem with that PS4 was not so much the color scheme as it was the crazy use of meaningless BLOPS3 icons that nobody understands in bright orange against dark gray. Now, admittedly, this controller has the BLOPS “III” roman numeral on it in orange. But the thing is—that basically just looks like a harmless if not kind of cool tattoo on the side of the controller that doesn’t have bright orange buttons. The result is a controller that has a very interesting color pattern, drawing the eye towards the d-pad and then the III. Moreover, with a controller like this one, you don’t have to worry about your living room looking like Corbin Dallas’ t-shirt because when it’s not in use you can put it in a drawer! 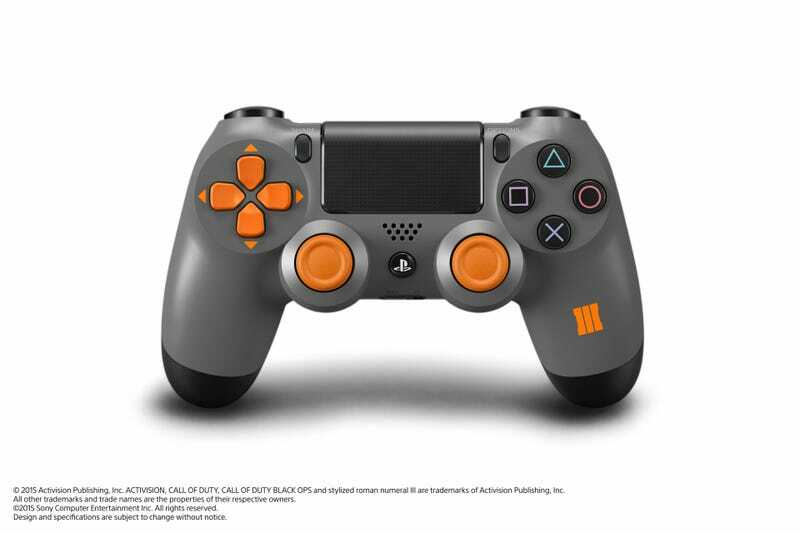 Anyway, all that said, upon seeing the COD BLOPS3 (yup, I did it again) PS4, I immediately said, “hahaha no thank you” to the PS4 itself but my eye was really drawn to that luscious orange-and-gray controller. “I want that,” my id said. “But you know it’ll never be available outside the bundle and you’re certainly not buying that awful console so forget it,” my ego replied. But my ego was wrong. The controller is going to be available outside the bundle! “Huzzah! Take that ego!” my id cheered. “Stop that!” scolded my superego. No but seriously. That controller is coming soon and will be available separately from the 1TB COD BLOPS3 (yuppppp) PS4 for those of us who are inclined for something a little less vanilla in our lives. The perfect controller for meat popsicles. You are reading TAY, Kotaku’s community-run blog. TAY is written by and for Kotaku readers like you. We write about games, art, culture and everything in between. Want to write with us? Check out the Beginner’s Guide to TAY and join in. Eight-Bit Hero shamelessly stole this tagline from Steve Bowling. He’s a professional by day, a dad by night, and a gamer at all other times. He tweets, he tumbls, and he also shares nonsense on Amiibo Amiigos.